14th January 2018 – World 5000m Champion Hellen Obiri (KEN) defended her title at the Kenyan Defence Forces Championships in Nairobi. 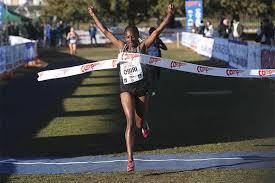 This sets her up nicely as she heads to Seville this week for the IAAF Cross-Country permit event there. Timothy Toroitich (UGA) backed up his victory in Amorebieta last week with another strong showing, taking third place in the IAAF Cross-Country permit event in Elgoibar. On her home turf of Scotland, Steph Twell (GBR) helped her team to fifth place in the 4 x 1km relay at the Great Edinburgh Cross-Country. On the roads Chris Thompson (GBR) made another podium when taking third place in the inaugural Ooredoo Half Marathon. Jordan Hasay (USA) also raced over the half marathon distance in Houston, and took eighth place with a time of 68:38.